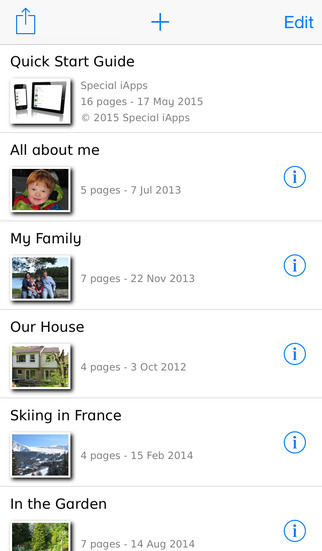 Special Stories is an app that allows you to create stories and visual schedules. It is particularly useful for creating Social Stories for children with additional needs. 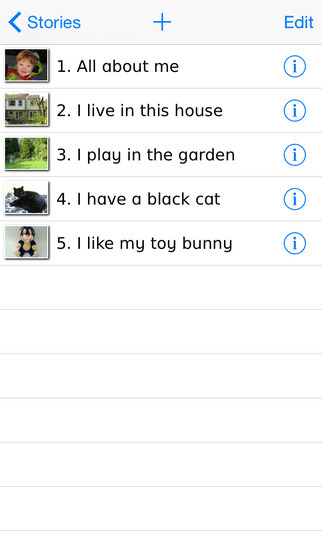 Special Stories is an app that allows you to create stories using text and images. 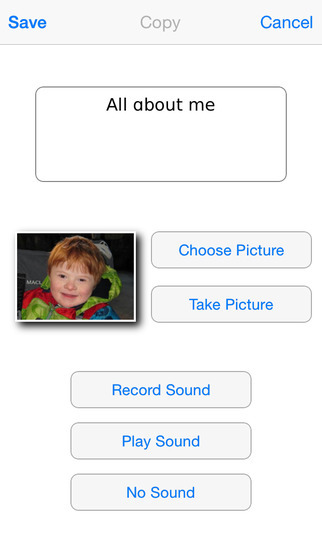 The app is particularly useful for creating social stories for children with Autism or Downs syndrome. Social Stories are short descriptions of a particular situation, event or activity, which include specific information about what to expect in that situation and why. They are used to reduce anxieties that may rise before an upcoming event and are a proven strategy used within the field of autism and other areas of specific needs. The app can also be used to improve reading skills, create step by step instructions, recap events, enhance receptive/expressive language skills and as a home-school communication link. The user interface is clear, intuitive and distraction free, an important consideration for children with attention difficulties. When launching the application you are presented with the stories you have created. When using for the first time, a quick start guide is already loaded to guide you through the process. On this page you can manage your stories into appropriate categories for future use. To create a new story, tap the plus button at the top of the screen or if you would like to create a story you have already created tap the ‘i’ button. The app enables you to create as many stories as you wish. It also allows you to edit stories later if you wish. As a teacher this is a particular useful feature, as having created many social stories over the years, the need to adapt and use one again for a different child is often the case. 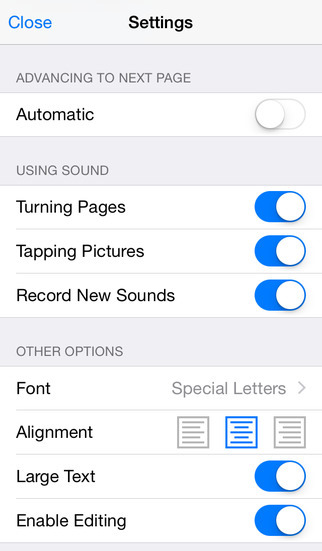 A really useful feature is the ability to record audio over each page. The app allows for up to a minute of recording. Using a familiar voice to the child when creating a digital social story is definitely a bonus. The ability to share stories across different platforms is a further plus point. Not only can they can be emailed as a PDF or EPUB file, they can can be shared to the developer’s Special Words app if required and also to ibooks. Before writing this review, I trialled the application with four children in our school, a school for children on the autism spectrum. It was a particularly useful time in the school year to use an app like Special Stories, coming to the end of the summer term at our school means various events happening that are not part of the regular school timetable, not to mention the long summer holidays. I created four different social stories using the application with positive results. The themes for each were the following; Sports day, Moving to secondary school, A trip to the park and Going on an Aeroplane. The four children had a varying degree of anxiety towards each event and required personalisation for each story created. The app was easy to use and following the tried and tested Social Story formula, I had created a useful narrative in no time. I used a mixture of images taken from the camera roll and saved google images to create each story. For children with difficulties with reading, you can choose not to use text if you wish. For ‘A trip to the park’ story, I followed the route the day before the actual trip and took pictures along the way. Once I had returned to school, it took me about 10 minutes to create the story and add audio recordings to each page. I introduced the story to the child on the iPad, they were immediately engaged as the tablet was already a motivator. The child enjoyed listening to the story and looking at the images on each page. The child listened to the story throughout the day and did not stress any anxieties about the trip the following day. The real bonus about using the app was the ability to share the story with the child’s parents at home. Overall, Special Stories is an excellent app and definitely one of the best of its type on the market. The developers have kept it simple in its design and have clearly considered this for their intended audience. Their website is informative and links to some of their other applications. The user guide is clear, informative and easy to follow and is also contained within the app as a sample story. The focus of my review was on trialling the app for social story purposes. However, the ways in which Special Stories can be used is not limited to social stories alone and the app can be used for a variety of literacy purposes. There are no negative points that I noticed whilst using the app, although I felt a user community that had the ability to share the stories would be a real positive addition. With Special Stories you can easily create your own stories, visual schedules and wonderful memories, with your own text, images and sound. An invaluable app for visual learners, to promote language acquisition, word, picture and sound recognition, speech and sight-reading. Used worldwide to create social stories. “I utilise social stories for teaching positive behaviours and unlearning negative behaviours. Special Stories will now give my social stories more life with an even greater personalised meaning to my students” – Frances, Teacher. 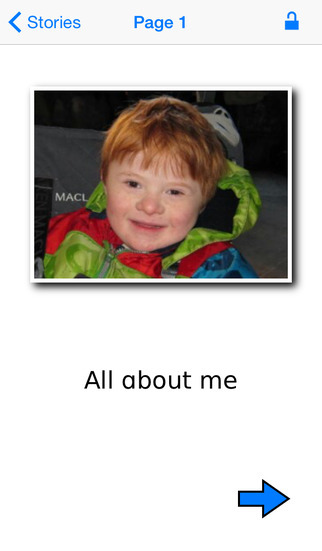 “My three year old daughter has Down syndrome and I have been struggling to make her picture. This app is amazing: I made a ten page ‘all about me’ story in under ten minutes and she loves it. I highly recommend this easy to use app. It is brilliant!” – Debbie, Parent. Ideal for use at home, preschool, school and in therapy sessions such as SALT and occupational therapy. Children and young adults with additional needs often need visual instructions and guidance with social skills. Special Stories allows you to lessen the stress by using familiar images and your own words and voice to ensure they are prepared for social situations. The possibilities are endless. You can easily add photos of places, people, objects or even your child’s artwork, to create unique and wonderful books to keep and share. The app includes a quick start guide in 14 languages, including English, Spanish, Dutch and German, but the app can be used to create stories in any language. Special iApps is a multi-award-winning nonprofit social enterprise that specialises in creating apps for those with learning disabilities and additional needs.